We can sell property most traditional estate agents cannot. Start the process with sitting tenants in situ to avoid empty property and no rental income. We have in-house legal advisers in our corner when we need them to help vacate tenanted property…… but we have also know better, more friendly ways to get the same results faster. SPEND LESS TIME PAYING COSTS WITH NO RENTAL INCOME. Section 24 a.k.a The Landlord’s Tax makes it is even more important to avoid finance costs on empty property. We manage the process from start to finish so that processes run smoothly and together. The figures stated fluctuate according to market conditions and seasonal influences. The following information is intended as a guide only. NB. Because 1/3 of estate agents’ agreed sales collapse, the actual time spent with an empty property and no rental income when sold through a traditional estate agent could be significantly higher however as we only start vacating a property once it has been sold and the deposit has been paid, the time spent with an empty property when sold through National Residential is unlikely to change. Contact us today to discuss our sales options and the best way to sell your tenanted property fast. If you want to downsize your rental property portfolio (e.g. to reduce finance costs to avoid higher tax bills as a result of Section 24 aka The Landlords tax) and avoid prolonged periods of having empty properties with no rental income to offset finance/running cost then our FIXED PRICE option may be best for you. We will agree a price you are happy to accept for the property then we will try to sell the property for a higher price within 28 days (there are no estate agency fees for this type of sale so we take our income from the difference between the price we agree with you and the price we can achieve). The price we can offer will be lower than you might expect to achieve selling a vacant property through an estate agent however you pay ZERO FEES/SALE COSTS (we do not charge fees or commission and we pay for the EPC, searches and legal packs etc) NOR WILL YOU PAY ANY COSTS INVOLVED IN VACATING THE PROPERTY and we pay £600 towards the legal costs to complete the sale. If you sell a rental property through us, the time you will be liable for finance / running costs while the property is empty will be dramatically shorter than if you have to vacate your property before a sale is agreed (in order to sell it through an estate agent). Add that to legal/court costs involved in vacating a rental property to sell it through an estate agent and the accumulated savings could easily be MORE than the compromised sale price. Our longevity depends on providing people with great value, great options and total transparency. If you choose to sell through us we will provide a detailed account of our expectations and if we do not achieve our targets, you can refuse all offers. As all our options are ‘no sale, no fee’, it is a risk free option. Added to the financial sense of selling property with sitting tenants through National Residential; we sell property in 28 days or less and usually complete in 56 days because we only sell to chain free buyers (though completion may take slightly longer if there are lots of complications) so not only do you get a great deal and a total solution, you also get the money in your bank faster than by selling tenanted property through traditional methods at an estate agent. And finally, if you need some money from the sale sooner than the time it takes to complete, we can arrange a CASH ADVANCE (to be repaid with interest/fees from the final sale amount) once we have secured a buyer – i.e. within 28 days. What you choose to do with the money (if you take it) is of course up to you but it is intended as an option that empowers people to solve urgent problems and/or maximise the value of the property and the offer we can make – e.g. you can use it to secure a purchase or pay off debts or extend a leasehold or organise repairs to secure a sale etc etc. We also have other sales options including a 7 day sale (where we can offer you appx 70% of the estimated value in return for a fast, guaranteed sale) and a 28 day sale where you take the full sales price but pay your own fees and all legal costs). Contact us now to decide which is the best option for you. 1) Contact us to discuss how we can selling property with sitting tenants. We will provide an approximate valuation of your property based on surrounding properties and recent sales prices. We will explain our sales options and if you are happy to provide us with any other information, based on your reasons for selling and any complications involved we will present the advantages and disadvantages of each option. What If I’m Not Happy With The Price At The End of The Auction? We set reserve prices for all our auctions so if you are selling your property through our fixed price option and we fail to achieve the price you have agreed to accept, you will have the choice if accepting a lower offer or refusing any offer. If you refuse all offers, you simple walk away. No sale, no fee. We take all the risks and absorb any costs we have encountered presenting your property for sale. My Solicitor Advices Me To Go Through The Courts To Force An Eviction – should I ? Evicting tenants that have broken the terms of a contract is definitely an option to vacate a property (assuming all tenants can be evicted that way) however it is a long and expensive process with no guarantee the tenants will follow the court’s ruling. We prefer to use eviction as a negotiating tool and to attempt a strategy of cooperation. How many tenanted houses have you sold? One of the main things that differentiates our services to those of a traditional estate agent is our willingness and ability to sell tenanted houses so a significant percentage of our sales are selling property with sitting tenanats. Very roughly speaking, we have helped hundreds of landlords sell property wit sitting tenants. Some tenants who may seem to be obstructing viewings simply do not want to be inconvenienced during the sales process and/or may have have issues that they feel they cannot discuss with the landlord (such as contract rules they may be breaking). While any breach of contract rules may be grounds for eviction, any attempt to have tenants evicted through legal action will be very costly and will take a long time. During that time, any unauthorised access by the landlord is a criminal offence. We have found through years of experience that our presence acting as mediators, together with carefully calculated rewards and incentives, we can smooth out most problems and find a better solution than legal action. A tenancy grants the tenant exclusive possession to the space they are renting – i.e. the right to exclude the landlord or their agent subject to any rights of entry the landlord reserves. Unlawful entry by a landlord to a tenanted property – e.g. to conduct a viewing – (even in response to a breach in contract by the tenant) can be considered as trespass or an invasion of privacy and a tenant could take action to claim damages or an injunction to prevent entry by the landlord/the agent. Legally, a landlord can pursue an eviction as a result of a breach of contract but the process is expensive, it will add considerable delay to selling a tenanted property AND the sale process can only begin after tenants are evicted so the property may be empty for a long time. As an independent 3rd party, we are able to negotiate with tenants to ensure all options are presented as fact rather than a threat. 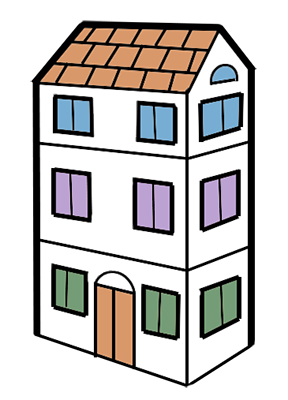 Even if a sublet is illegal, the subtenant still has legal rights that must be considered. The (official) landlord cannot cancel a subtenancy or evict a subtenant while a mesne tenancy (a sub contract between the subtenants and the landlord’s tenant) is in place because he or she has no legal relationship with the subtenant. To evict subtenants, landlords must first evict their tenant (the mesne landlord) who is often absent when subtenants occupy a the property adding further complications and delay to any court action. During a process to evict a tenant, a landlord cannot accept rent directly from subtenants otherwise they become tenants by. If a mesne tenant surrenders their tenancy and the landlord accepts the surrender, subtenants become tenants and are protected by tenant’s rights. Landlords often think they have no option than to wait for a tenancy to end to see their rental property because some estate agents will not list tenanted property. An obvious benefit of selling a property with vacant possession from the start is a wider choice of estate agents and the option to list with the one that promises the biggest sale price. Unfortunately, this can be counter productive especially if the rental property is a buy to let with mortgage costs. The running cost of an empty property generally get bigger as time elapses when security becomes an issue and landlords find themselves liable for council tax. By offering the property for sale with an unrealistic selling price, landlords are risking long periods of cash drain. Landlords who simply cannot afford to keep an empty property running indefinitely often contact us after their property has not attracted any attention for 6 months or more because we can also buy rental properties in 7 days or sell rental property in 28 days for full market value. 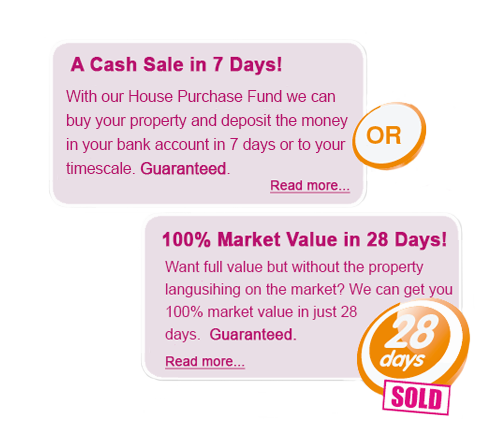 Unlike our fixed price option which is usually best for landlords selling tenanted property, our 28 Day 100% Market Value option does not include any cash advance option or our involvement in vacating the property. It works more like a traditional estate agent’s – sellers receive the full amount of whatever buyers are willing to pay and we charge estate agency fees. However, the sale period is limited to 28 days and offers over our low starting prices are visible as bids. Just like any other auction, sellers can set reserve prices so if they are not happy to sell a property for the highest price offered, they can withdraw the property from sale. To find out more about all our sales options, contact us today and we’ll call you back. Every landlord knows trusted tenants are a valuable asset, so why not simply sell to a new landlord or property investor? Good question and the simple answer is we do… we have a database full of property investors and landlords and we always let them know when we have a property we think will interest them. However, we also know investors drive a hard bargain so to get the best price possible for property, we open all sales to the public and advertise it locally as well online in property portals like RightMove. By doing so, even if an investor or landlord buys the property, our sellers can rest easy that no one else would pay more than the highest offer we receive. Trying to vacate a house of multiple occupation with multiple tenants is a nightmare if landlords try to wait for tenancies to end or go through courts. Likewise arranging viewings can be impossible without every tenants’ cooperation. National Residential specialise in selling tenanted houses including houses of multiple occupation by working with tenants instead of against them. 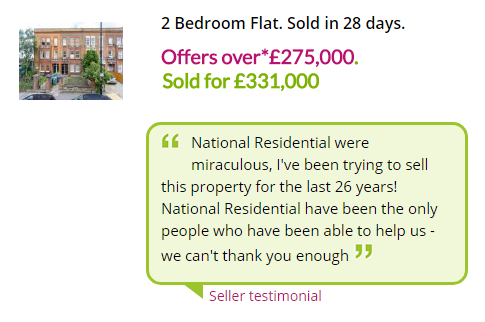 Our client came to use after being unable to sell their property through traditional methods. He could not afford to have the property empty for long periods of time and didn’t have accessible funds to prepare the flat for sale. We sold the flat with the full cooperation of sitting tenant in place and helped to secure him suitable alternative accommodation. With the cash advance we loaned to the seller, he was able to extend the leasehold on the flat enabling him to get a far better price than if it was offered with a short leasehold.